Allochthonous input of resources (i.e., originating from a place other than where they are found) can have a significant impact on food availability for consumers. We assessed the impact of an allochthonous source of food (the sewage outfall stream of a military base) on an avian predator breeding in a low-productivity, high-arctic site (Alert, 83°N, 62°W, Ellesmere Island), the long-tailed skua (Stercorarius longicaudus). We collected blood samples throughout the breeding season during two contrasting years of lemming abundance to characterize diet composition of skuas and evaluated the contribution of the anthropogenic and lemming food sources using stable isotopes (carbon 13C and nitrogen 15N). 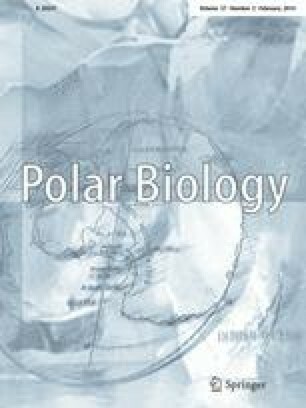 The isotopic signature of skuas changed seasonally because they switch from a marine to a terrestrial diet when they come ashore to breed but also differed between the 2 years of the study. Anthropogenic food source accounted for 33 % of the summer diet but this proportion varied between years, from 41 % (5–95 ‰: 13–59 %) in a year of low lemming abundance to 16 % (5–95 ‰: 10–21 %) in a high year. Skua nest density recorded in years of low lemming abundance at Alert (0.15 nests/km2) was higher than at any other comparable arctic sites (0–0.02 nests/km2). Overall, the use of an anthropogenic food sources apparently subsidizes skua reproduction at this site, which could affect the food web of this low-productivity ecosystem. The online version of this article (doi: 10.1007/s00300-013-1423-4) contains supplementary material, which is available to authorized users. An erratum to this article can be found at http://dx.doi.org/10.1007/s00300-014-1530-x. We thank the Canadian Armed Forces and Environment Canada for permission to work at Alert and the staff of the Canadian Forces Station for their very professional and extensive support. We thank F. Vézina, J. Carrier, M. Cloutier, and C. Morrison for field assistance, A. Tarroux for technical assistance with SIAR, and F. Rousseu for help with statistical analyses. We are very grateful to B. Walter for his excellent nest searching during summer 2003. We are greatly indebted to G. Yannic for kindly sexing the birds. We also thank M.-C. Cadieux and all members of Gauthier’s laboratory at Laval for fruitful discussions and comments on this project, as well as P. Flint for his comments on our original manuscript. Financial support was provided by the International Polar Year program of the Government of Canada, the Natural Science and Engineering Research Council of Canada, the National Wildlife Research Centre of Environment Canada, the Centre d’Études Nordiques, and the Université du Québec à Rimouski.